The Universal Holy Synod held on 31 March 2014 at St. Jacob´s Syrian Orthodox Monastery in Atchaneh – Lebanon. The Holy Synod chaired by the Catholicose Aboon Mor Bsalious Thomas I and the membership of all the archbishops of the Syrian Orthodox Chruch. 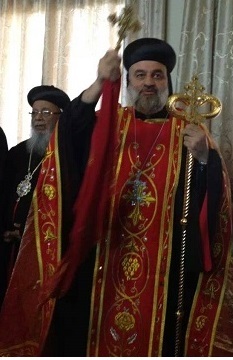 The Holly Synod elected Metropolitan Mor Cyril Aphrem Karim as he 123rd Patriarch of the Syrian Orthodox Church of Antioch. During installation he was known as Moran Mor Ignatius Aphrem II Karim. H.H. was born on May 3, 1965 in Kamechli - Syria in a Syriac family. He entered St. Ephrem’s Theological Seminary in Lebanon in 1977. From 1984 to 1988 he pursued higher studies at the Coptic Theological Seminary in Cairo, Egypt, receiving a Bachelor of Divinity degree upon graduation. In 1985 he took the vows of a monk and was elevated to the sacred priesthood. From 1988 to 1989, he served as both the secretary of H.H. Mor Ignatius Zakka I Iwas, and as a teacher at St. Ephrem’s Theological Seminary in Damascus, Syria. In 1989 he entered St. Patrick’s College in Maynooth, Ireland from where he received a licentiate of Sacred Theology degree in 1991 and his Doctrine of Divinity degree in 1994. On January 28, 1996, he was consecrated as Metropolitan and Patriarchal Vicar of the Archdiocese of the Syrian Orthodox Church of Antioch for the Eastern United States by Patriarch Ignatius Zakka Iwas at St. Mary’s Syriac Orthodox Church in Kamishli, Syria. Cyril arrived in the United States on March 2, 1996, and was officially installed at St. Mark’s Syrian Orthodox Cathedral in Teaneck, New Jersey.